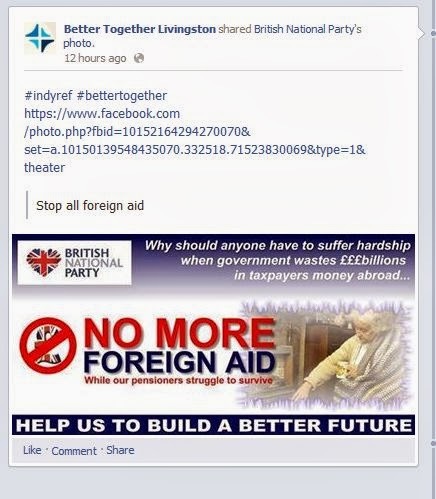 Tocasaid: Better Together official promotion of the BNP? Better Together official promotion of the BNP? While vegetating on the #indyref offerings, I stumbled across the above nugget of interest. This was taken, today 11/1/14, from Better Together Livingston's Facebook page. Not only do they reproduce the BNP's propaganda, but they add their support. Pro-Yes campaigners have often alluded to the backward and right-wing nature of British Unionist politics. It must be rare though for an 'official' branch of Better Together, lead by ex-Trot Alastair Darling to actually leap into far-right politics with such glee. 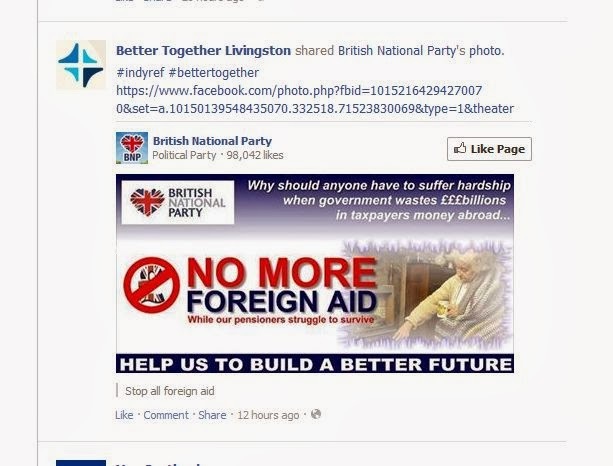 Loose cannons are to be found in all political viewpoints - however, is Better Together so desperate for support that they actively promote the BNP? Is it Better Together 'policy' to "stop all foreign aid"? 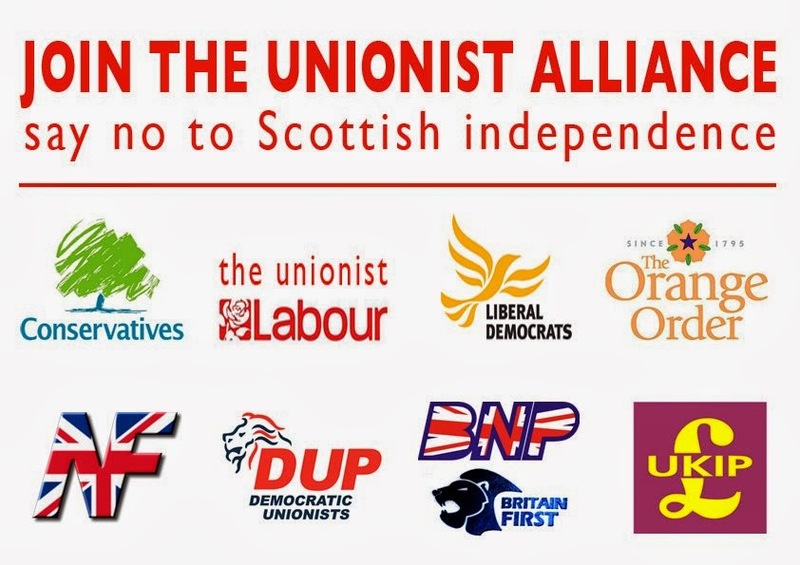 The following graphic, I imagine, was meant to be a spoof of right-wing xenophobic BritNat politics. Maybe it too emanates from the 'grass roots' of Darling's campaign against progress? bloody hell !!! VOTE YES !!! Whether or not this page is a fake remains to be seen. Something similar arose months ago with NF logos displayed. Further, one only has to look at the official Better Together leafleting events for Livingston to see that around half of the ten or so participants are Orange Order members or supporters. BNP? Orange Order? There's not much between them and neither gives you much of moral highground. Anyway, their pages are open so check for yourself. Some of their pics are classy, real Christian worship like.